What’s more American than church and beer! Forget everything you think you know about America. Forget Kim Kardiashian, forget the Tea Party, forget Lin-sanity, forget about Breaking Bad. YES EVEN BREAKING BAD. Your world is about to be torn apart. People tweet more about church than beer. BOOM. Mind. Blown. Was it good for you? Apparently, the words – “church” and “beer” – are the most relevant to highlight that huge issue we’re concerned about this election season known as The Great American Cultural Divide, clearly exemplifying the two (just two) sides. According to Floatingsheep.org, anyway. And this is a website with a recent blog post about mappingthezombieapocalypse, so everybody pay attention. … Not to insult Floatingsheep. Using data mining and social media in this way—gleaning information about populations and such—is still a pretty new thing that a lot of government agencies, NGOs, and private sector institutions are just starting to get a handle on, so it’s pretty cool for anybody to use it at all. Heck, it’s fun. But let’s take a look at what’s actually going on in this particular survey before we all go blowing our tops about how this reveals the true split and span of the American religious/secular landscape divide. So what does it tell us, exactly? Honestly — nothing. Within a one week period at the end of June, the site extracted all tweets containing either the word “beer” or “church” that were geotagged within the continental US (meaning the Tweeter allowed their GPS data to be public and show where they were when they posted the tweet). There were more “church” tweets (half of which came on Sunday) than “beer” tweets. When they put the tweets on a map of the US, it showed which regional areas favored which words. And yes, it really is that simple. San Francisco has the heaviest ratio of beer-to-church tweets, with Boston following a close second. LA tweets the most in general, ratios aside, and Dallas has the most geotagged tweets about church. New England seems to heavily favor beer; the Midwest ranges around a middling-to-equal ratio, and the South is all in the red—the colors, of course, correspond somewhat to the political Red – Blue dichotomy we can’t seem to live without (red for conservative, red for church, blue for liberal, blue for beer), and Floatingsheep dutifully “notes the alignment.” Which is kind of visible. In concentrated areas. Sort of. Obviously, this should all be taken with a grain of salt. Floatingsheep kind of does so, noting first of all that only one to three percent of all tweets are geotagged. They also allow that there is zero context for whether the church tweets were about spirituality, Foursquare check-ins (“This of course echoes the Sermon on the Mount and the famous verse, ‘Blessed are those who check in for they shall inherit the badges of righteousness,’” they quipped) or tweets about separation of church and state. There is no real analysis involved at all, but look at the pretty pictures! The truth that this “survey” means nothing, in itself, but if anybody bothered to take it and try to make a real study out of it, they might actually learn something interesting and useful. Head to Dallas, San Francisco, that really red patch of Florida, and Boston; identify and interact with those individuals who tweet a lot about church, or beer, or both, and spend some time with them. Why do they tweet about these topics? How representative is their Twitter performance of their actual, real life? Are people just not mentioning the boozy brunch they head to after church? Do urban hipsters keep their faith activities private while tweeting about microbreweries? Go to the bars and ask people about their religious lives; enquire of the Sunday parishioners how they spent their weekend nights. Find the crossover, find the distinctions, DISCUSS. Peoples’ lives aren’t as clearly defined as this study, and CNN’s wash of it, would imply. 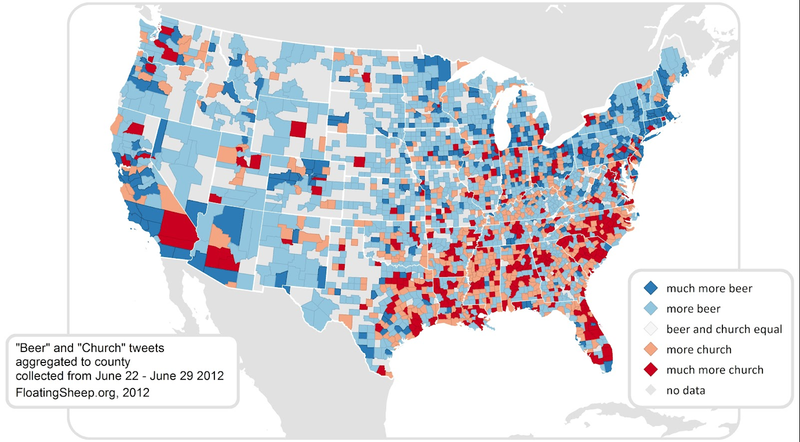 I’ll concede that beer and church are definitely prevalent in America—but their prevalence alone doesn’t interest me. It’s what lies behind and between that can tell us something complicated about who we really are.